March has not been a good month for Southern Africa. To the north of South Africa climate change resulted in the worst natural disaster ever recorded in the southern hemisphere. A cyclone hit Mozambique, Malawi, Zambia and Zimbabwe. One town alone in Mozambique, Beira, with a population of nearly a million, was virtually totally destroyed. You have seen the news, and as we were nowhere near, I will say no more about this human and environmental tragedy, other than it was a brutal act of nature. 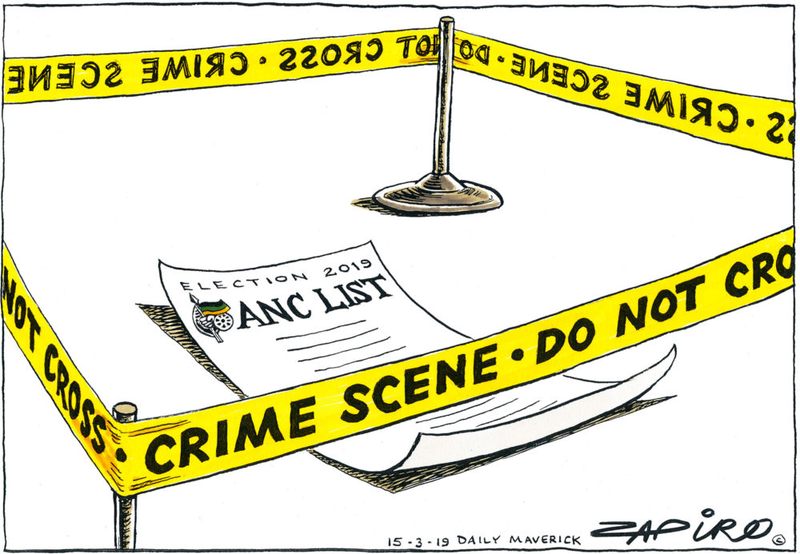 South Africa is also in national election season taking place May 8, and if anything it may even be uglier than what happens back in the States. Multiple communities across the country believe the only way they can get attention to the corruption and lack of provision of services like housing, water, electricity, healthcare, and education, that so negatively affect their lives, is to protest. Most of these protests become violent, with burning of schools, government facilities, trains, anything they can vent their anger on. One cute trick is to burn tires on the national freeways and disrupt traffic. We saw this in Cape Town last week when the main road through Hout Bay was obstructed. Just the other day my hiking group had to cancel our hike because the national road between Plettenberg Bay and Knysna was closed. Politicians and government officials who have tried to speak up against or expose corruption have been intimidated, and dozens have been murdered over the past 12 months. There is a case running here in the Knysna courts where an ANC official is being charged with the murder of another ANC politician who exposed corruption. With all this, life does go on. We enjoyed a wonderful week mid-month in Cape Town spending quality time with our grandsons over the school holidays. Because Lara lives in Hout Bay we decided to stay close, and lucked out with an amazing find, and one we truly recommend. An historic hotel, the Hout Bay Manor, had gone to ruin when it was rediscovered by a South African woman married to a wealthy German philanthropist. The hotel was completely redone, decorated with an eclectic African theme, active spa, the rooms luxurious with 4-poster beds, and a good restaurant, EAT, with both a western and an Asian menu. Hout Bay is a major fishing village, so fresh fish is really fresh fish. Being distant from central Cape Town, the rates are extremely low. Staying in Hout Bay also gave us the opportunity to explore parts of Cape Town we had not visited in years. The crown jewel is the Chapmans Peak Drive that leads out of the far end of Hout Bay. It is one of the most spectacular coastal drives in the world on the south-western tip of Africa overlooking the Atlantic Ocean below, and equally breathtaking both ways. We visited Noordhoek with its vast white sandy beach and the, once quaint but now rather tacky, coastal town of Kommetjie. The boys enjoyed a place called Imhoff Farm because of the snake park, the petting zoo, and of course, a place to eat. We returned to Cape Town a couple of weeks later to celebrate Moira’s brother’s 75th birthday. 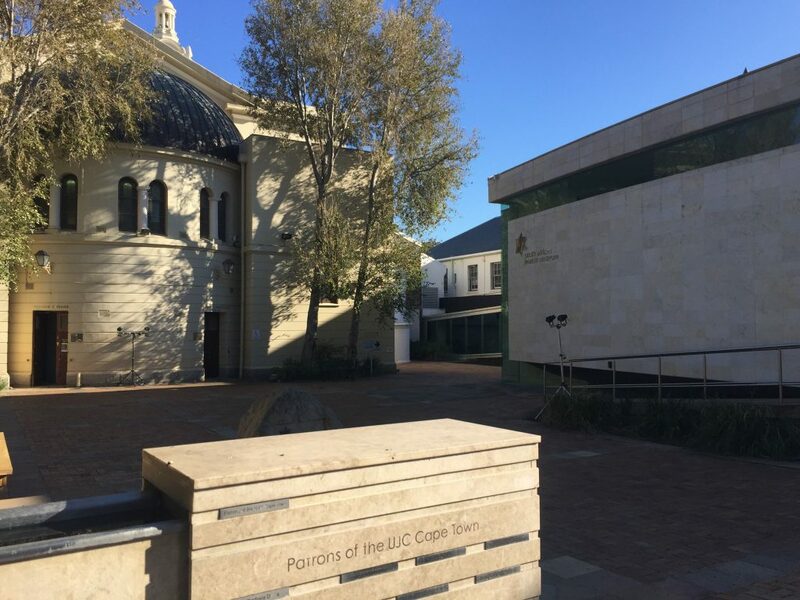 This included spending Shabbat services at the Gardens Synagogue in the center of town, the oldest Jewish community in South Africa, situated next door to the South African Parliament buildings. 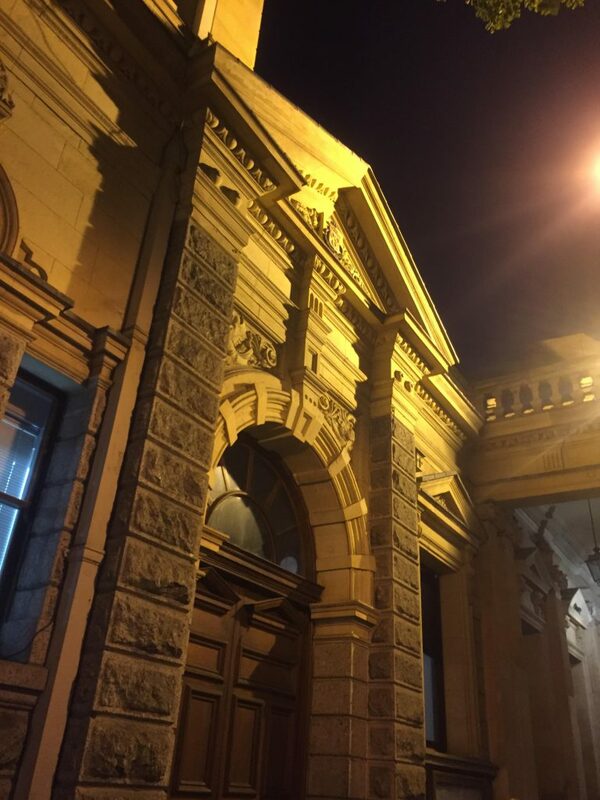 Known as “The Mother Synagogue of South Africa,” the original 1849 building no longer exists, but there are two historic structures on the campus, the 1863 synagogue which houses an excellent Jewish Museum and the 1905 synagogue. There is a sense of vibrancy in the shul which is now Chabad. The architecture harkens back to Europe, and the 1905 synagogue, although larger and in wonderful condition, resembles the Choral Synagogue in Vilna, Lithuania. This is not surprising given that the majority of South African Jews are Litvaks. There is also a Holocaust Museum, and the entire complex is on the must-see list of numerous international tourists. One could spend a whole day in the area because it abuts onto the historic Company Gardens established by Jan Van Riebeek in 1652, the South African Museum, and the South African National Art Gallery. 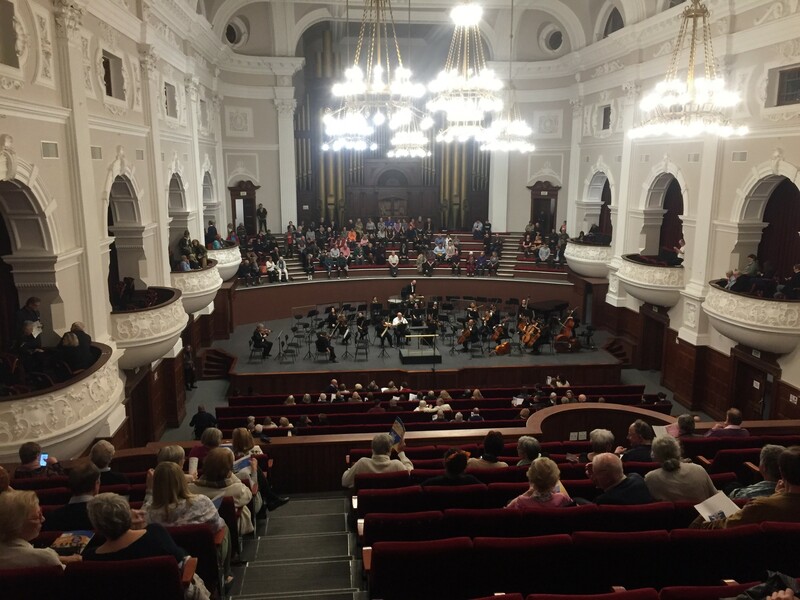 We also were delighted to have the opportunity to hear the Cape Town Philharmonic Orchestra in their recently renovated concert hall in the Cape Town City Hall. The only downer, after a glorious program of Bach, Beethoven and Brahms with the orchestra under the baton of Principal Guest Conductor Bernhard Gueller, Music Director Laureate of Symphony Novia Scotia in Canada, and Brazilian pianist Alvaro Siviero, was to be hustled by the desparately poor people in the parking lot after the concert. Speak about the chasm between the haves and have nots! The days are shortening in South Africa and the weather cooling. We have barely a month left in this beautiful but troubled part of the world. With our children and grandchildren living here, except for Rebekah at Kenyon College in Ohio, our hearts grow a little heavy as our time to leave draws near. Let me close this month’s letter with a view of sunrise from our deck at Belvidere. 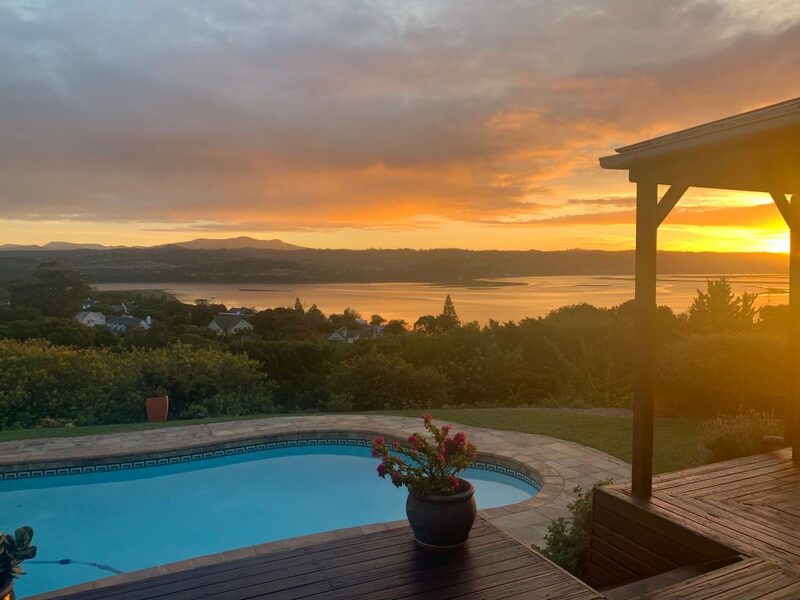 SUNRISE FROM THE DECK OF OUR HOME IN BELVIDERE, KNYSNA. Cape Town and Belvidere, April 9, 2019. The other nostalgic memory you evoke is the City Hall and the orchestra – Nat and I were subscribers for the decade before left in 1978 – Last 5 years we had seats in the box above the tympny on the left in your picture – next tyo the “Mayoral ” Box !!! I enjoyed the nostalgia your visit and photos brought to me – Thx !! 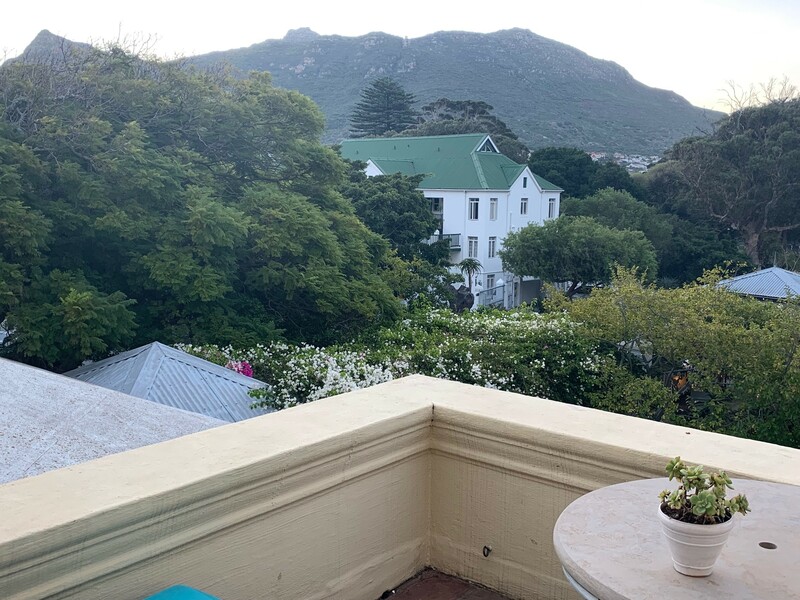 Great letter as usual but somewhat depressing The beauty and charm of the renovated hotel, the description of Hout Bay and surrounding are including Kommetjie and Chapmans Peak bring back a flood of pleasant memories and recall of the beauty of that area. Contrast this with the corruption, the destruction of roads and property and the ramifications of “load sharing”.